In the late ’50s and throughout the next decade and beyond, among the underground most ridden film genres there was the so-called ‘mondo movie’, basically made of a collage of several scenes with a commenting voiceover. 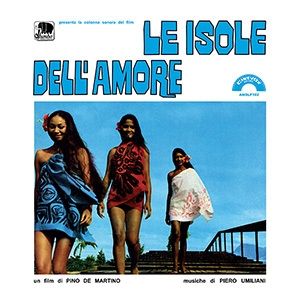 To this category belongs “Le isole dell’amore” (The islands of love), a film that’s practically impossible to find today, set on an island in Polynesia, in the heart of the Pacific Ocean, an oasis of peace in which young tourists seek refuge from the hectic life of the so-called ‘modern society’. Piero Umiliani, already experienced in the documentary field (see for example “Angeli Bianchi… Angeli Neri” on the theme of magic, or the famous and controversial “Svezia, Inferno e Paradiso / Sweden, Heaven and Hell”), provides here further evidence of his skills as composer, with a score of exquisite music that features three basic ingredients: the ethnic one, characterized by the use of tamouré, a typical percussion instrument of the islands of Oceania; the symphonic one, dominated by strings arrangements that seem to lull the listener with their melodies; finally, the acoustic one, with extensive use of the guitar: as atypical this may be in this context, it perfectly fits, thanks to Umiliani’s composition skills. This faithful reproduction of the original 1970 edition, edited by AMS Records, is the first reissue ever of this LP. To make this work even more unmissable there is also the presence of Alessandro Alessandroni’s I Cantori Moderni in the choruses of “Tamouré” and “Vele al vento”, the same artists who were gracing, in those very years, the soundtracks of Sergio Leone’s western masterpieces!